I'm in Haven: Simon Says Stamp LOVE Release Blog Hop and Giveaway! 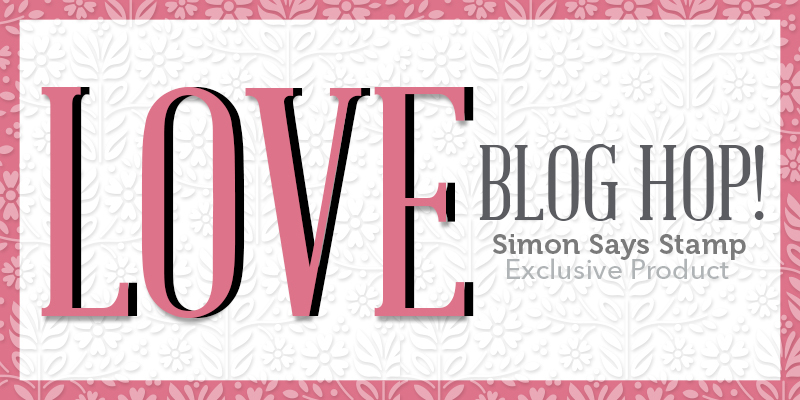 Simon Says Stamp LOVE Release Blog Hop and Giveaway! The season of Love is upon us...and love is not only in the air, but it's at Simon Says Stamp with their new release, appropriately called...LOVE!! This release has some amazing new stamps and dies that have made me, and I'm sure will make you, fall...in...love!! You should have reached my blog on the hop, from Heather Ruwe's blog! 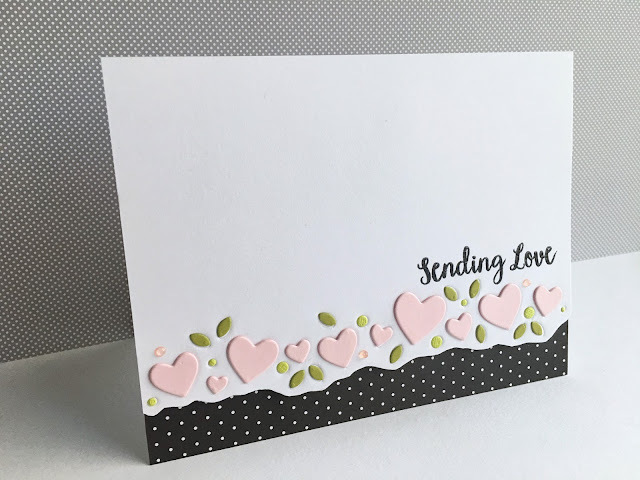 My style of creating is generally pretty clean and simple, which is probably why I'm so in love with this die...the Cupids Heart Border die is wonderfully simple and simply lovely...perfect for a clean and simple cardmaker!!! I popped up the heart panel over the polka dots and added some of the Jewel Drops. 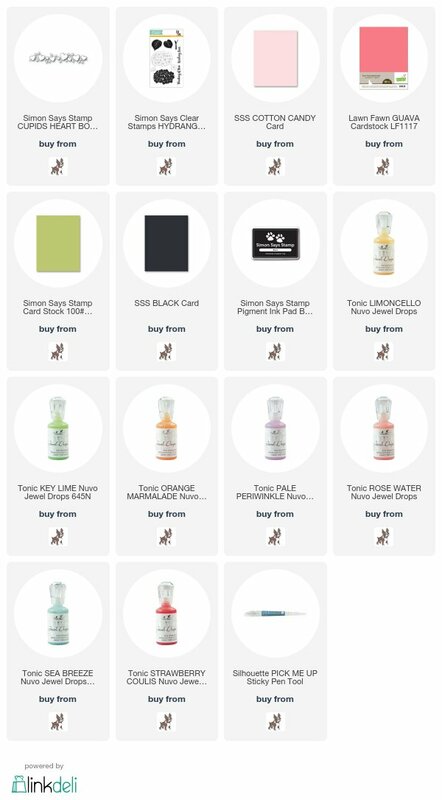 Simon Says Stamp will generously be giving a $25 coupon to one commenter from each and every blog on the hop, simply leave a comment for a chance to win!! The winners will be chosen and be posted on the Simon Says Stamp Blog this coming Wednesday, so make sure you check the blog to see if you're a winner! 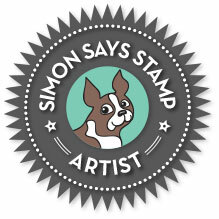 The next stop on the hop is back to the top of the hop, The Simon Says Stamp Blog!! 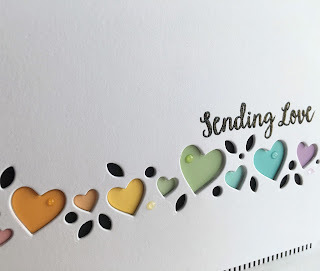 All the participants of today's blog can be found on the Simon Says Stamp Blog, you can head there if you should get lost...hope you will check out everyone's inspiration today!! Lovely! I really like the simplicity of the hearts and leaves in the soft colors you chose. So pretty! All lovely! Clever idea to emboss the die for placement on your first example. Fabulous cards, I like how you used the positive and negative! Fabulous cards, I love the clean simplicity of them although I am still aware lots of work went into them. Beautiful simplicity, thanks for sharing! Pretty examples! Thank you for all your hard work! Very pretty cards. Great use of the die cuts to avoid waste. I've got this one in my cart already! I love your clean style of cards. I'll definitely use your idea of dry embossing the base and then popping a set of cut pieces on over the design. Great idea! I love what you have done with this die. i adore the clean and simple style of your cards. just beautiful!! I just love these heart cards! So cute! Your cards are all simply beautiful. They really make a statement. Thanks, for sharing. Beautiful cards! I love the idea of embossing first and then layering on die cuts. I'm a follower of yours. I love your style and have "borrow" many of your ideas. Once again I love these cards. You're killin' me! Those are gorgeous, I love your clean style - white space with pretty pops of color gets me every time. Love your cards, thanks for sharing! I love your cards simple and clean yet so pretty! Very pretty cards! Such a great die! Love your choice of paint chips for color on all the hearts. They are so sweet in the colors with the dots as well. So many cute ideas with the same die. these are all adorable! love the CAS style and the designs!!! Love these cards! And love the colors you used! Great designs. OMG, I'm not a heart person but your card designs tell me I NEED this die! 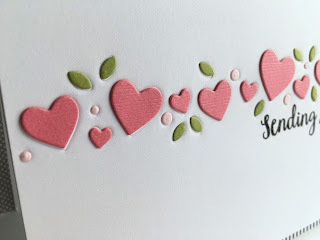 that cupid heart die looks fantastic in whatever color you used, Lisa - wonderful CAS cards!! I like the rainbow hearts the best! Love these Lisa.. I especially like the LAST ONE -- I am a Polka Dot fan! Love this new border die. Really love what you've done with it. Great new release. I like your clean and simple style! These cards really show off the heart die!!! Thanks for the hint to dry emboss the border to aid in placing the stacked die cuts. Your cards do suit the C & S type of cards. They are beautiful. I have been eyeing this die, so I am glad you created cards with it! Love what you created! These valentine cards are beautiful! What a comforting card with the pinks. I really love that one. Love your cards! That little bit of stripe paper showing on the first two cards is just the perfect touch! Thanks for sharing! LOVE your cards! I have paint chips saved too! :D Love the last one with your hand cut border and the polka dots!! Think I'll have to come back here once my heart die arrives! Thanks for all the instructions! So sad that this wonderful blog hop has come to an end...but now it's time to go shopping! Have a great day! I absolutely love the cards. I love the clean and simple design of these. The results are wonderful. Thank you. You are so talented--thank you for inspiring me to create. I absolutely love your beautiful cards and I love that die. You gave me some ideas on what to do with it. I love your different examples with the stamp products. Thank you for your inspiration. Pretty cards! Such a nice border die! Love your cards.. Thanks for the ideas for the die I already ordered!!! I love your style and how you make the most clean and simple cards pop. You are a talented lady and you sure made me want more new products. All 3 of these are great, and you have just sold me on the Cupid's Heart border die. I loved the cards you made with the streaming heart die, but these are equally beautiful. Gonna need to add this die to my wish list. Beautiful cards. I love the use of the positive and negative images. I love this die and love all three of your cards too! Love the die and the ideas! Love your clean and simple design and the ways it really showcases the die. Very beautiful, yet simple cards! Love them! The Cupid Heart Border die is so versatile, lovely in so many ways. Love your ideas. Thank you for sharing the inspiration. Thanks for the variations on the same die! these cards are so beautiful, Lisa! I especially love the last one with the hand cut border and the polka dots!! Love the inlay technique of all of your cards. Wonderful use of that die! They are all very sweet cards! Love how you used both the negative and positive space. These are just my CAS style too! Your cards are so cute! That heart die is a must have. Thank you for sharing. These cards are so pretty. I like the idea of embossing the die first to make it easier to place the die cuts where they belong. I love the polka dots on the bottom of the card. It really made the hearts pop! Simply beautiful! Beautiful cards! I love all the ways you used that die set, great inspiration! Thank you for sharing! All three of your cards are delightful! I love CAS cards that still have lots of detail and interest as your do. These are simply stated and simply wonderful. Nicely done. Although clean and simple they are just stunning! I love the pretty colours on every card. Thanks for these beautiful examples. Clean and simple and beautiful! Love the soft colors you used. Love, love, love the clean and classy look of your cards! So beautiful. Sweet card designs with this border die. I always love your creations and these are no exception. You are always happy mail in my inbox. Thanks for the great inspiration. I really want this die. Beautiful cards. SO happy you used this die. This was on my wish list and seeing the inspiration makes me want it even more!! Cute! Love your simple and sweet cards. Awesome cards. I simply adore them. Hi Lisa. Love your pretty cards using this super cute die from the new SSS Love release. Love all the dies and stamps - so great. Thanks so much for your inspiration. Truly a great border die and you rocked these cards out of the park. I can see this being very addictive. Beautiful cards, Lisa. I like them all and the border die used is fantastic. Perfect for a clean and simple card. Thanks for sharing. Your cards are so beautiful. Really like the black and white polka dot paper on the one card. Thanks for sharing. luv that you embossed the base die on your first card before placing the colored pieces on - rather than inlaid. clever and classy! Very sweet cards. Fun to make them different ways. Thank you for sharing. That heart die is great! and yes, your cards are simple and simply elegant! Lovely cards! I especially like the one with different colored hearts - just unexpected and so pretty! Lovely cards. So many cute versions of the Cupid Heart border. What an ingenious way to use a border die! Thanks for the inspiration! Love your self of white space. Cute cards. These are all beautiful....a great use of this die. Sometimes simple is the best and most elegant! Such elegant cards. This die is so pretty 'in use'.. it did not catch my attention until I saw the wonderful cards you created. Beautiful! 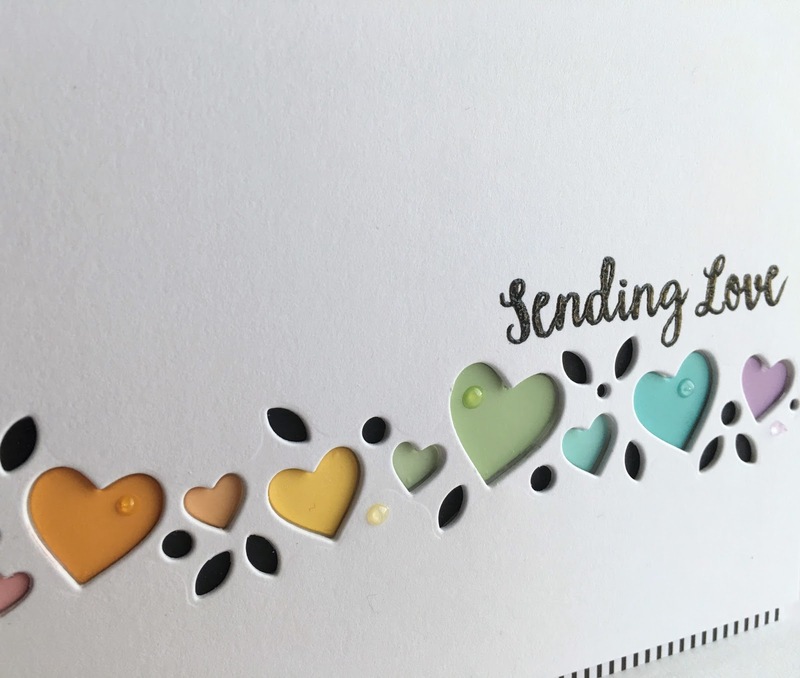 Love your color combos and you lovely cards! Oh my word Lisa, these are sweet, loving that die. Love, love, love these cards! You've made me change the order of my wishlist to put this die on top! Beautiful cards! Very clean and simple, but with a enough color to make them fun. I love the last card with the fussy cut edge. ahhhhh i love the cupid's hearts border die too! such cute cards! These are adorable!!! And that die is fabulous! I think the second one with the cut out hearts, is my favorite. Beautiful cards!! Thank you for the inspiration. Love all three cards. So clean and simple, yet each is stunning. The Nuvo drops are a perfect touch. Thanks for sharing your amazing cards with the cupid heart border die. Love the dainty hearts! Great new die! Love how you used the same die to make such different cards! Pretty cards! 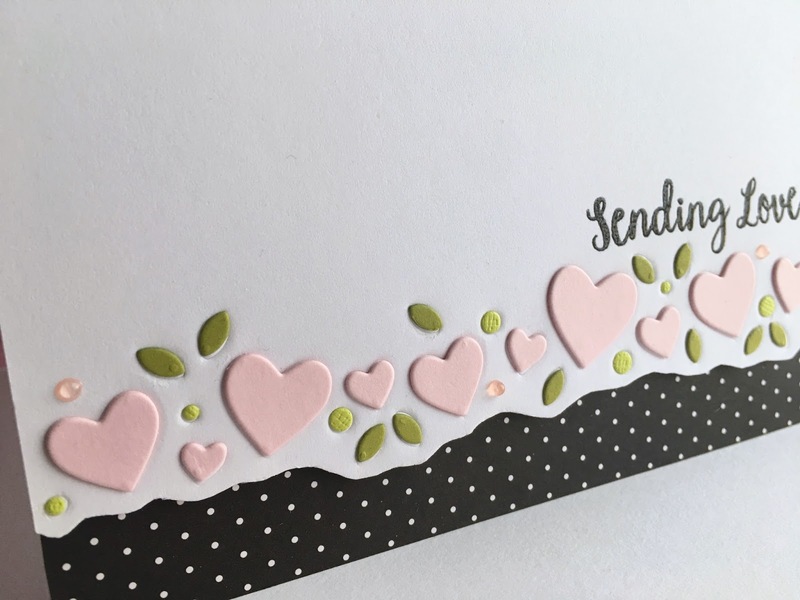 Love the hearts border die! This is so simple and lovely. Lova that you use the positive and negative of the die cut! Love how you have you used the border die, the result is amazing. 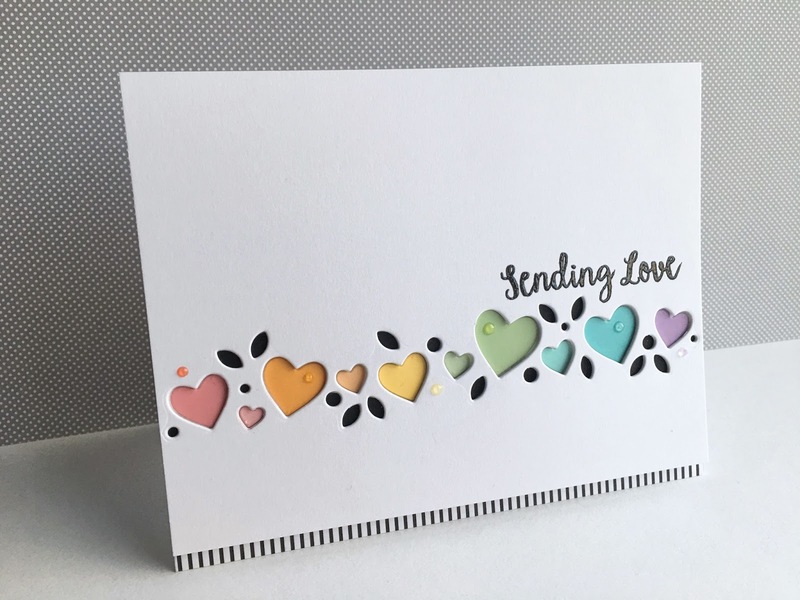 Loved your cards using the cupid heart die! I think this one will be coming to my house soon. It is darling. Thanks for sharing. Sweet cards! I love your CAS style and use of paint chips. Great idea to impress the die to provide the correct placement of the die cut pieces on the card base. I am in love with your cards! They are absolutely gorgeous! Gorgeous cards! I love your CAS style! I always love how elegant your cards look. Love, love, love these cards! The person that receives these cards will know they are loved. Your cards are gorgeous! I love the clean and simple look -- you really showcased the die set! Thanks for the inspiration! Love the addition of the black polka dot piece. It really makes the card pop. Love your 3 cards using this sweet border. Love how CAS they are - so pretty! Simple but very elegant! love the cards! The cards are simple but lovely! Awesome CAS cards, love the variety of looks by just changing colors! Clean and beautiful technique! What I strive for every time. I like lots of white background on my cards too. Sweet cards using the new Cupid's Heart Border Die! I love how you used this die to make completely different looking cards - so versatile. I love all three, Lisa! Your clean, simplistic cards are always so pretty & my favorite style. The die is perfect for so many uses & using the cut outs & the negatives is wonderful. Simple and elegant. They saved for the best for last on this blog hop! Beautiful cards! I love your style! Cute and pretty ca d..
Love the variation on your cards. First was simple but elegant and then cheerful and back to simple but elegant. Thanks for sharing. I love how you highlighted a simple little die cut to make it the star of the show! What wonderful ideas! Now I'm thinking about getting this die, when I have looked past it at every other stop! The simplicity of the card makes it so pretty. It really makes the hearts stand out and adds to its beauty. Thank you so much for sharing. A very nice card. I love those trailing dies! Clean and simple and beautiful. Love your cards. Sweet, simple and elegance - WOW! Beautiful! Love how you recycled the striped paper from the packaging -- my kind of girl! Thanks for being part of the blog hop! 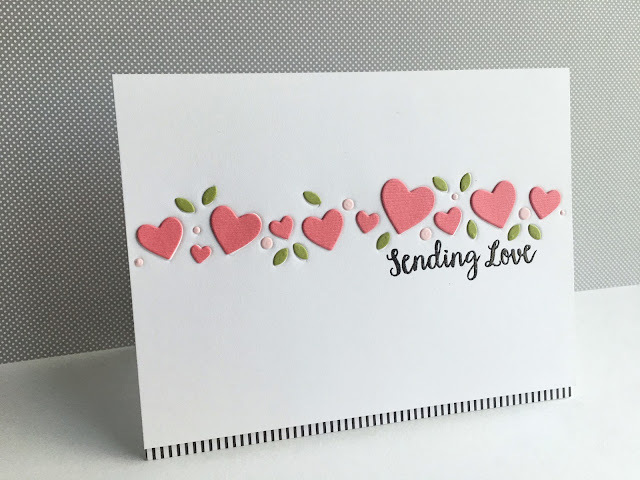 Love your designs with that fabulous heart border. Fabulous set of three different cards from one die! Thanks for showing multiple ways to use the same die. I always get stuck in a rut when using dies, it’s nice to see I have other options! All three cards are lovely. I like how you used the same stamp and die, but each card is unique!! You are a very clever crafter!! Love your cards. I appreciate that you showed several different ways to use a single die. Three simply beautiful cards, just my style. Thank you for sharing. Love each of these cards. The various ways to use this product achieving such different looks is great. I can see grabbing this Cupid Hearts Border die all the time. It will be so easy to make a quick card that looks amazing. Love your cards. This die is my favourite from this release. Love your cards. Nice! I especially like the pink and black combo! Nice and simply beautiful. Love the different looks you were able to get with this one die. Great job! Seeing your cards with that heart border has made me want that border! Beautiful work! Fabulous cards! Can't decide which color combo I like better. Love them all! Wow, I just love your card samples! I think this die is my favorite item from this release, so much fun! Thanks for sharing! LOVE your cards and this awesome new release!!! I so that these are so simple but still adorable! Also, I love those nuvo drops! They are so subtle and really add to the design while still keeping it clean. I'm still working on incorporating nuvo drops. I liked that you shows both ways of using the border die on different cards. I am inspired by each and every one of these! I want to CASe them all! You showcased the dies so well, but your card layouts are simply beautiful, too! Such sweet heart cards. Love the dies. Beautiful cards! The first is my favorite.